You know that feeling of when you’re certain a new product was made just for you? That’s what I felt when NVIDIA announced its SHIELD portable at CES earlier this year. In fact, I had nightmares in the weeks that followed because I swore a product manager had been reading my mind (the scare came from wondering what else they stumbled on). I’m a big gamer, but not a big mobile gamer. Well, not until SHIELD came along. I’m the type of PC gamer who couldn’t imagine preferring a gamepad for a first-person shooter, and likewise, I couldn’t imagine doing much gaming with a touchscreen. I’ve tried – believe me – but the stint never lasted for long (save for the simplest of games). NVIDIA’s SHIELD looked to fix all of what made mobile wrong for me. I wanted a gamepad. I didn’t want to have to connect a tablet to a dock and then a USB dongle to that and then use a gamepad. I also didn’t want to be locked into a limited-use device, or one that has a limited selection of games, a la PS Vita or Nintendo 3DS. SHIELD was the solution to those problems. As seen in the shot above, SHIELD is the merging of gamepad and tablet. The result, aesthetically pleasing. While it’d be nice if the tablet could be separated from the gamepad for external use, it can’t be. The reason? 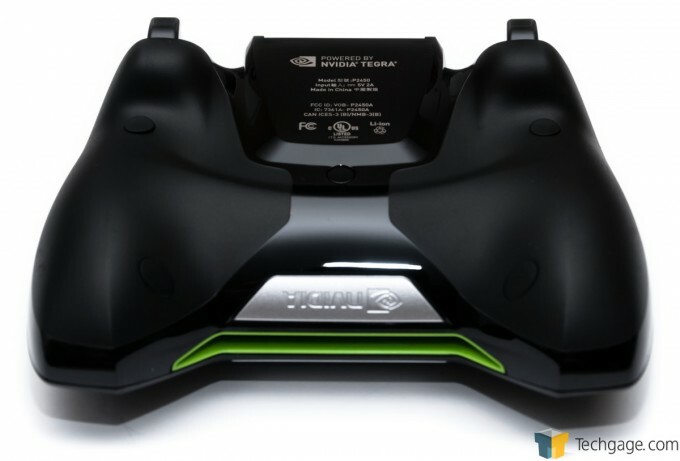 All of the hardware is stored in the gamepad, including the rather large 28.8Wh battery. It must’ve been a challenge to optimize the space available, that’s for sure. SHIELD’s goal isn’t just to offer a great platform for gaming, and NVIDIA is careful to avoid that sort of wording. Because it’s based on Android, the possibilities are endless; NVIDIA dubs it a “Gaming & Entertainment Portable”. We’ll cover both of these aspects at some length throughout the article. * -$50 or -$100 with the purchase of an eligible graphics card. The footnote in the above table is important, because if you’re planning to pick up a new NVIDIA graphics card this month, you’ll want to consider the offer to receive either $50 or $100 off the price of a SHIELD. This is on top of free games that will come with either qualifying card; the value overall is quite significant. SHIELD’s metallic cover is held on by a magnet – take it off and customize! 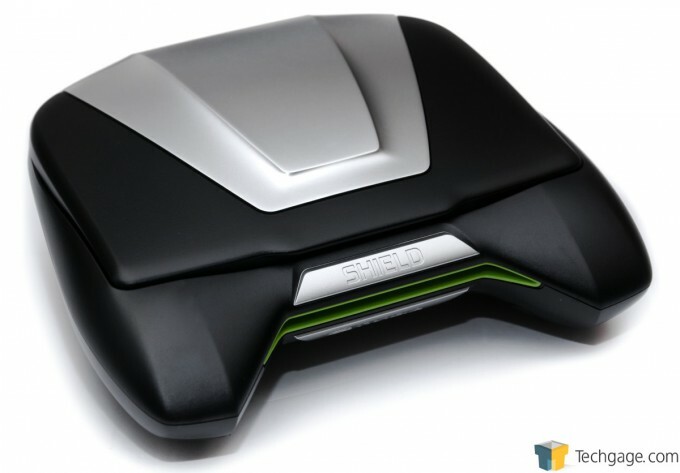 The SHIELD of course features NVIDIA’s latest and greatest mobile SoC, Tegra 4, boasting 72 GPU cores and a 1.9GHz Cortex-A15 quad-core processor. It also includes 2GB of RAM, 12GB of user-accessible storage, the ability to massively upgrade that via microSD, a 5-inch 294ppi display, dual-band Wi-Fi, Bluetooth, GPS, a mini-HDMI port, a mini-USB port, and a headphone jack. SHIELD isn’t the lightest tablet out there, but that shouldn’t come as a surprise given it has an entire gamepad built into it. That larger size does allow for a nice battery, however, which as we’ll see later will allow for some impressive overall battery-life. 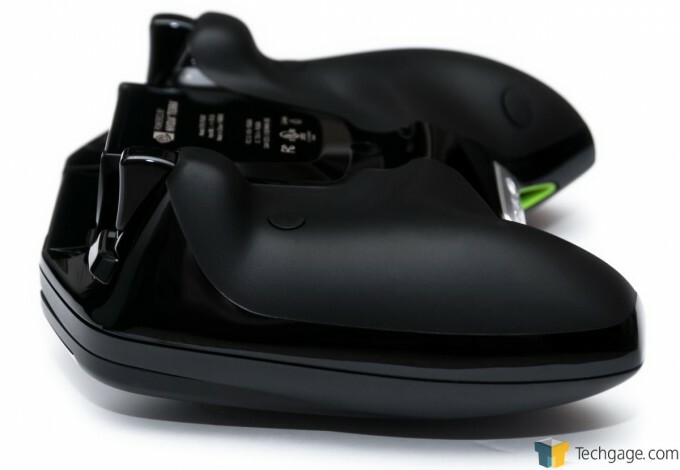 For the gamepad on SHIELD, NVIDIA targeted the general design of a PlayStation DualShock. Given I’m a diehard Xbox 360 gamepad user, I would have preferred an analog stick where the D-Pad is located, but that could have proved challenging given the display closes down on top of the gamepad. Like any gamepad change, expect to spend a little bit of time getting used to this. Despite being a mobile device though, the gamepad doesn’t feel too cramped. As you may be able to glean from the shot above, SHIELD is contoured to fit most hands comfortably. For me, I find it to be almost as comfortable as the Xbox 360 gamepad – the biggest difference is the weight. Looking from the side, we can see the trigger on either side, and also the top bumpers (well, at least the right top bumper). Neither of these buttons are difficult to push when holding the SHIELD. I’m having a hard time coming up with an idea of how to make SHIELD’s design better. 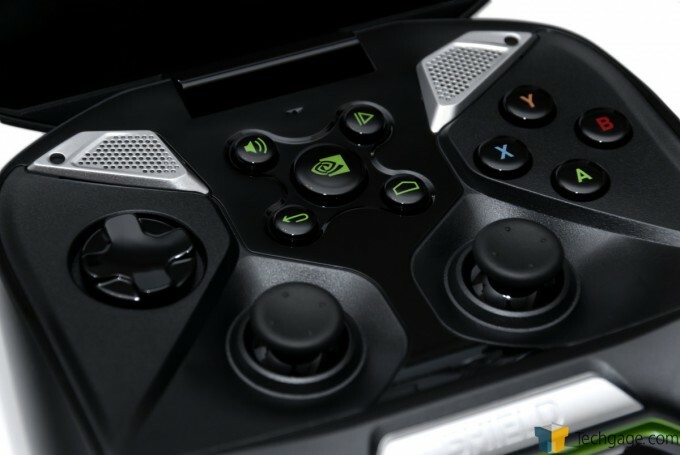 I admit that its button layout sometimes forces me to stretch a finger a little too far, but I can’t see how things could be improved-upon given the fact that NVIDIA had to make some design choices here in order to support the closing of the display – and the company certainly didn’t want to make SHIELD larger than it already is. The gamepad takes a little getting used to, but after a while it just becomes natural. Throughout all testing, I didn’t encounter an issue with button responsiveness, and I also found the buttons to be mapped quite well from one pre-configured game to the next. Since I’m not likely to touch on it again until the end, I need to mention the front speakers, which are impressive. 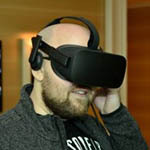 Given NVIDIA had a little bit of room to work with right under the display, the speakers implemented are some of the best I’ve seen from a mobile – notebook, smartphone, tablet or other gaming handheld. It can also get quite loud – almost uncomfortably so (which I consider a good thing, as I hate the volume cutting off just below where I’d like it). Being a gaming-targeted device, NVIDIA knew SHIELD had to have decent audio, and it delivered. 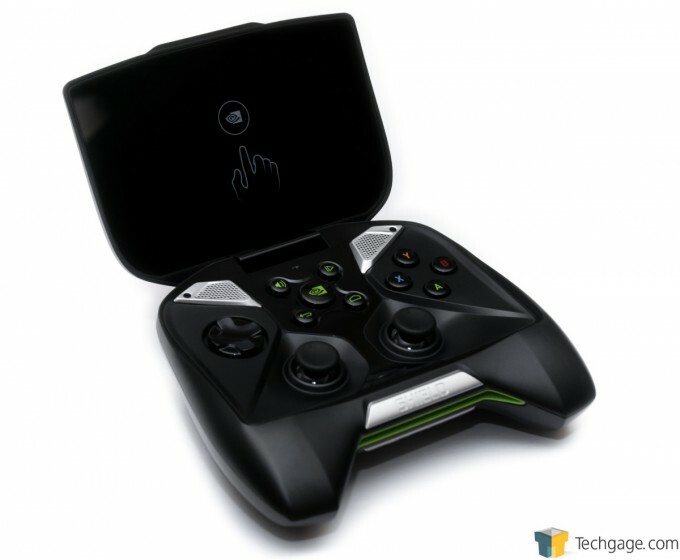 SHIELDs sold up to this point have shipped with Android 4.2 “Jelly Bean”, but NVIDIA a couple of weeks ago released an update to bring it up to the just-superceded 4.3. Given the device’s age, it seems likely that an Android 4.4 update will be released in the future, but given all it brings to the table (or rather, doesn’t), I’m not sure I’d consider it to be high-priority on NVIDIA’s part. 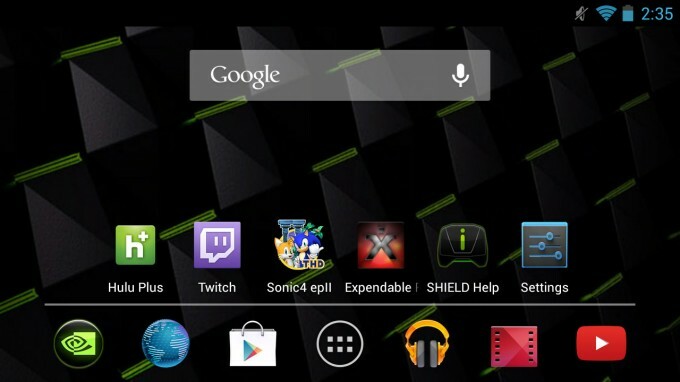 NVIDIA sticks with the default Android launcher for SHIELD, though there are some tweaks built-in. The SHIELD application, for example, isn’t an app, but is hardcoded straight into the OS. Apart from that, few modifications seem to have been made, though because of the high PPI or some other aspect of the display, some alternative launchers might have difficulty in displaying things just how you want. I gave GO Launcher Pad a quick test, for example, and its default configuration had the icons spaced too close to one another. I plan to give other launchers a test in the future, because while the stock Android one is suitable enough, it lacks some of the power user features I like (such as being able to kill background processes, configure the dock, have better control over the apps screen, et cetera). There’s a lot to cover with SHIELD, so let’s waste no more time and get straight into things. First, we’re going to look at Android gaming on SHIELD, and follow that up with a look at some of the device’s key features, such as GameStream, Console Mode and Gamepad Mapper.